For the Pennsylvania Turnpike Commission (PTC), HMMH is conducting a traffic noise study for the full-depth reconstruction project from milepost 320 to 326 in Chester and Montgomery Counties. 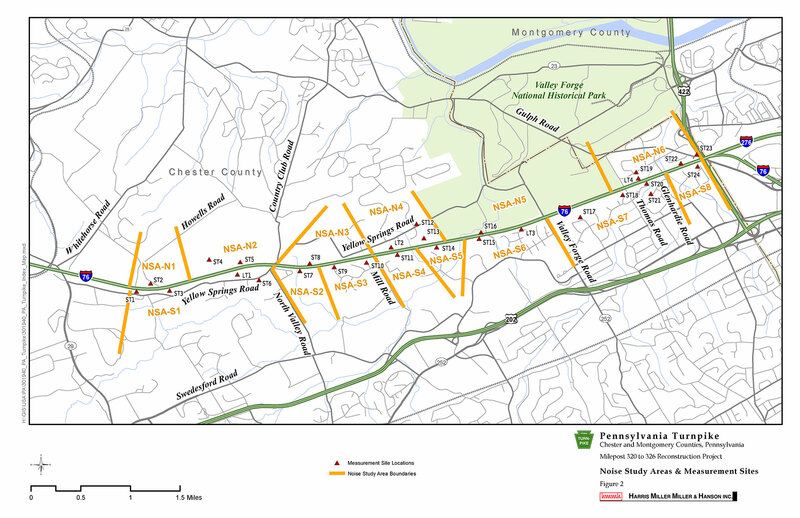 Beginning in 2007, HMMH conducted field measurements and preliminary noise analysis for 14 Noise Study Areas covering the full length of the project area on both the eastbound and westbound sides of the Pennsylvania Turnpike. The preliminary analysis determined that noise barriers are warranted, feasible, and reasonable in 11 of the study areas. Subsequently, HMMH undertook final noise barrier design, including additional measurements and noise barrier optimization using the FHWA’s Traffic Noise Model (TNM Version 2.5) for those 11 study areas. The proposed noise barriers are expected to benefit approximately 1,006 receptor units based on PennDOT criteria, as utilized by the PTC. In addition to performing noise measurements and modeling, HMMH has participated in public outreach efforts throughout the project including public plans display open houses, legislative and design roundtables, and follow-up on individual inquiries from residents.